The crown jewel of Southwest Florida comes with stunning, waterfront homes, world-class shopping and dining, and unmatched amenities – in Marco Island, luxury is more than just a word. It’s a lifestyle. Living in Marco Island is like experiencing a tropical getaway that never has to end. Tall, gently swaying palms can be found lining the shaded roads, and the beaches nearby are simply stunning. High-rise condos all around offer incredible club packages that include services such as a pool-side concierge, food and beverage discounts, complimentary cabanas on the sand, and much more. Plus, the homes by the Gulf are some of the most gorgeous around, bringing together impeccable design and architecture with the natural surrounding landscaping and foliage. And why wouldn’t you want to make your home the place voted one of the “Top 5 Most Beautiful Small Towns in America” by USA Today? Between the fabulous beaches, towering condominiums, unrivaled shopping, dining, and entertainment, majestic homes, and much more, living in Marco Island is like enjoying a stay at a world-class resort – one that you get to call home. 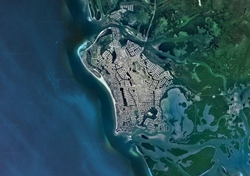 With the small city being covered with gently snaking canals of Gulf water, you can be sure that your new home here will very likely be on the sandy banks. With no restrictions to a specific architect like you might see in a gated community, the homes of Marco Island all have a unique flair and charm that makes them incredibly desirable. If you’re a water enthusiast, these are the homes for you. You’ll be right on the water or near it at all times, and boating, fishing, and swimming are commonplace. Spending a day on the bays and rivers is the perfect way to unwind after a long week, and catching some fish at the same time only makes it better. You’ll have nearly 100 miles of navigable water at your disposal as well as easy access to the Gulf of Mexico, and you’ll love exploring the picturesque backwaters of the Ten Thousand Islands aquatic preserve. All of this is right outside your new home in Marco Island. If there are any residences that rival the luxury and comfort of Marco Island’s single-family homes, it’s the towering condos. Rising from the beaches to overlook the Gulf of Mexico, these incredible buildings are designed and built to provide you with a high-quality lifestyle that incorporates local amenities, exclusive features for residents, and much more. The most attractive thing about these condos is the worry-free lifestyle that comes with them. When you get back from work, you don’t have to worry about fixing the lock on the front door, or trimming the hedges, or any other tiresome and tedious upkeep and maintenance. Everything is taken care of for you, and you can rest assure that your home will always be kept to the highest standards. Pristine landscaping around the building, fabulously maintained amenities, and more are what you can expect when you live in one of Marco Island’s famous condominiums. The local flavor surrounding Marco Island is that of a fun, upbeat resort, and nothing beats spending a night on the town or simply relaxing on the beach watching one of Florida’s famous sunsets. Being on the water at all times means there’s never a shortage of things to do. With 100 miles of navigable water, along with fast access to the vast Gulf of Mexico, boating is one of the most popular activities here. You’ll be able to indulge in all kinds of water sports as well, including kayaking, deep-sea fishing, sailing, and more. If you feel at home on the open water, then Marco Island is the home for you. It’s a place that will keep you entertained, but also relaxed and intrigued. Visit the nearby Tigertail Beach and observe the incredible bird habitat, relishing in the natural sights and sounds of the native wildlife. Plus, the magnificent Everglades National Park will provide you with countless hours of information and breathtaking views of Florida’s most famous preserves. Marco Island is a beautiful integration of nature and homes, and living here will give you a new appreciation of Southwest Florida’s beauty. And when it comes to golf, Marco Island is home to some of the nation’s most impeccable and exclusive courses. The private Island Club championship course, home to such legends as Tony Lima, Gene Sarazan, and Ken Venturi, is a breathtaking design that mirrors all of the beautiful landscaping of the surrounding property. Or, you can visit the hidden gem that is the Hideaway Beach Golf Course – an executive, 9-hole course that boasts flawless Bermuda grass and stunning views of Marco Island and the many lakes and canals running throughout. The city is one-of-a-kind, and it’s clear from the first moment you arrive. From the gorgeous palm trees shading the streets, to the sights of the Gulf from nearly every home or business, to the warm atmosphere and friendly disposition of everyone who lives here, Marco Island is the kind of place that draws you in and makes you fall in love with its comfort and charm.